Say congratulations with these bouquets of fresh flowers, guaranteed to show you are thinking of the whole family in this time of joy and happiness. If you decide to choose a bouquet made by Alison's Designer Florist you can do so with confidence, knowing that it will also be hand delivered on your behalf, giving your order a personal touch that means so much. Sending flowers to Liverpool,Maghull, Lydiate, Melling, Aintree, Aughton, Ormskirk, Bootle and surrounding area of Merseyside has never been easier, quicker or more reliable. 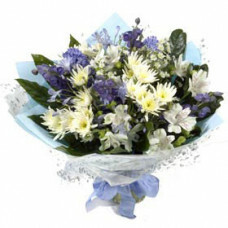 Let us help you make someone’s day a day to remember and choose to send flowers to Maghull with us. Pick your favourite bouquet from our Congratulations collection .